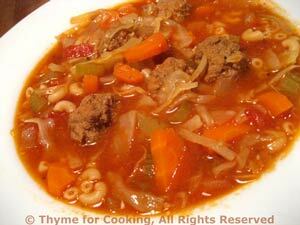 Tomato Meatball Soup, easy soups from Thyme for Cooking. This is a quick soup (as soups go). Use any small pasta: orzo, small elbow, vermicelli; or break spaghetti into 3" (7cm) lengths. Add more chili powder or hot sauce if you like. Best of all it has meatballs... We love meatballs. This serves 4 - 5... or 2 meals for two with, maybe a lunch leftover. It freezes well, too. In large Dutch Oven (soup kettle) heat the beef stock and tomato juice over medium-high heat. Mix egg, breadcrumbs, oregano, basil and Worcestershire. Form into small meatballs, 1" (2.5cm) in diameter. When stock/juice is boiling slowly add meatballs, keeping them separate until they start to cook. Cut carrots in half the long way then slice into thin half-circles. Chop the tomatoes, reserving the liquid. When soup is boiling again (after addition of meatballs) you can start adding the rest of the ingredients as they are ready. Add all remaining ingredients, except pasta but including reserved tomato juice stir well, cover and bring to a boil. Reduce heat and simmer 30 minutes until all vegetables are done. If using pasta, add after 15 minutes, and stir every 5 minutes until done.